What do a nun, Andy Warhol, and Campbell’s soup cans have in common? The answer: 1962. It was during this year that Corita Kent, then known as Sister Mary Corita, saw Andy Warhol’s new work, Campbell’s Soup Cans, the now legendary piece that inspired her to produce her first Pop art prints. Kent saw Pop art as a powerful way to express messages of love, peace, and social justice. By re-contextualizing familiar slogans, Kent harnessed the subliminal messaging and exuberant colors used by popular brands and used them for her own purposes. During her lifetime, Kent appeared on the cover of Newsweek, in numerous magazine and newspaper stories, and was named woman of the year in 1966 by the Los Angeles Times. Despite the acclaim she received throughout her career, her name has often been overshadowed by contemporaries such as Roy Lichtenstein and Warhol. Kent did not fit the mold of the Pop artist, mostly an all-boys club, yet Kent’s legacy continues to grow as her ever-relevant messages of love continue to connect with new and familiar audiences. 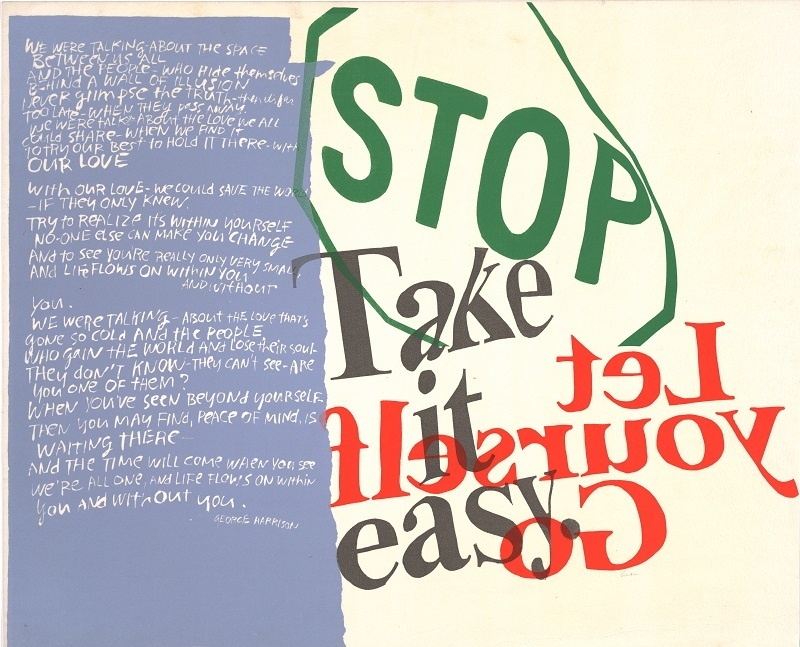 See Kent’s powerful imagery in, Power Up: Corita Kent's Heavenly Pop, beginning February 25. This spring, the Crocker will host three exhibitions, each devoted to an important American female artist: E. Charlton Fortune, Corita Kent, and Faith Ringgold. Because the dates of these shows overlap, they offer a unique opportunity to explore in depth the subject of women in 20th-century art history. From Fortune’s picturesque Impressionism to Kent’s spiritually-infused Pop and Ringgold’s socially-engaged quilts, we will explore the unique contributions these women and their sister artists have made to the history of American art. More information and tickets available HERE. Inspired by the silkscreen prints of Corita Kent, students will study the principles of design through stenciling. More information and tickets available HERE. Inspired by the bold imagery and messages infused in Power Up: Corita Kent's Heavenly Pop, the Crocker’s free Art of Parenting series returns with a dynamic discussion on digital electronics, media literacy, and child development. Experts will offer helpful tools for making decisions around your child’s use of digital media, presenting different perspectives. For more information and a link to register click HERE. The lives and work of Corita Kent and Faith Ringgold, featured in exhibitions at the Crocker through May 13, offer stirring examples of artistic practices extended into activism. In this provocative panel talk, we take inspiration from these women to hear from and about artists connecting art and social justice. Speakers include Michael Duncan, a scholar and curator of Corita Kent's work. More information and tickets available HERE. Begin with a tour of Corita Kent's prints at the Crocker, then explore each step of the printing process at Myrtle Press, located at Verge Center for the Arts. Participants will print multiple layers on fabric and paper using the photo emulsion process. More information HERE.